Location: Near SE corner of gardens, facing S over Boulevard de Nantes. By W Goscombe John. John Cory, coal owner and philanthropist. Unveiled 1906, in presence of its subject. By Goscombe John, RA Inscribed: "This statue is erected by his friends and fellow citizens as a token of their appreciation of his world-wide sympathies. 1906". Bronze standing figure with weight on left leg and with right leg inclined forward. Figure clad in suit and open great coat; hat in left hand and book or paper in right hand. Tall stone plinth in Classical style. 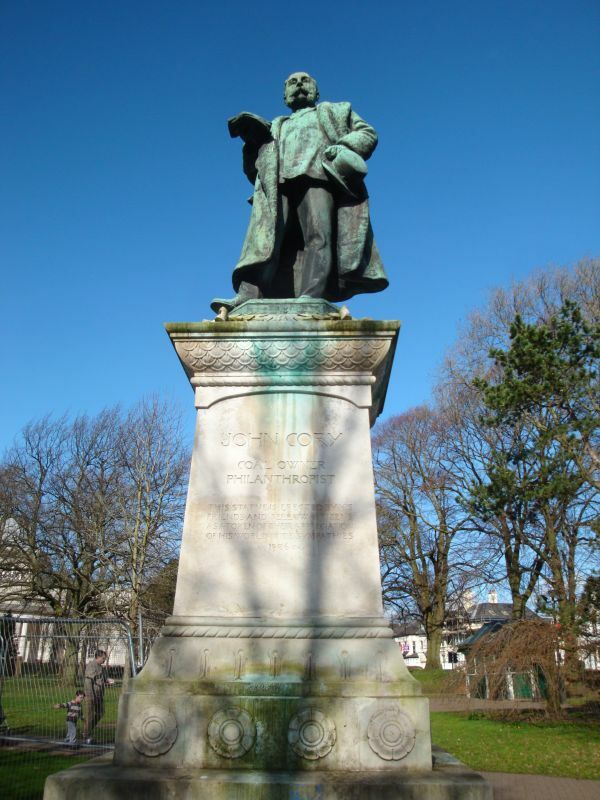 Listed as fine public statue by important Welsh sculptor on key site in Civic Centre. On N corner of Greyfriars' Road.